Welcome to the home of the European Ultimate Championship Series (EUCS). I'm happy to annouce that all Regional Committees succeeded in defining the dates and locations of the various EUCRs. The best Open and Women teams of these tournaments will advance to the EUCF in Frankfurt (GER) on September 28th-30th. National Federation (in the following just NF) are responsible for the payment of the deposit for the EUCRs and for the approval and the submission of the EUCS rosters of their teams! A detailed description how the FFindr-based rostering system for the Championship Series works will be sent in spring. This is the list of activities you (that is, your representative in the Regional Series Committees) are supposed to perform and the due deadlines. Please notice that these deadlines might slightly be modified by the single RSC Head Coordinators, if there have been already previous agreements with the Tournament Directors of the EUCRs. Latest 10 weeks prior EUCR the NF must accept/deny the assigned number of bids in each division. Latest 8 weeks prior EUCR the NF must centrally pay the deposit for all accepted bids to the EUCR Tournament Director. Latest 6 weeks prior EUCR the NF must submit the list of the teams participating in the EUCR in each division, giving at least 2 contacts per team. Latest 4 weeks prior EUCR the single teams must pay all remaining fees to the EUCR Tournament Director. Latest 3 weeks prior EUCR the NF must submit the approved EUCS rosters for all their teams. Please notice that on the roster all team members should be listed and not only those who will participate in the EUCS. Any change to these rosters after this date will be automatically considered an addition (see the EUCS Eligibilty Rules). Any communication must be done by your representatives in the various Regional Series Committees (RSCs) per email. Emails must be sent to the RSC, with the EUCR Tournament Director in CC. The list of the various national representatives can be found in the Regional subpages. Thanks a lot to all members of the various regional committees, who made a great work in planing and defining the EUCRs! With you as active link between the EUCS Committees and National Federations we have a very efficient and effective process! The EUF Central Series Committee is proud to annouce that the EUCF 2012 in the division Open (24 teams) and Women (10 teams) will take place from Sept. 28th to 30th 2012 in Frankfurt (Germany). This bid had been declared as best among five very interesting ones. The tournament will be in the same location of the Open+Women German Championship 2011. The venue offers 8 high quality fields all at one site and the possibility to camp or sleep in a gym directly at the fields. Various accommodations from low-costs up to luxury are in the surroundings. The Frankfurt Internation Airport is just 15mins away. The team fee has been set at 470 € which will be due latest 10 days after the Regional Tournament (EUCR) or not later than Sept. 10th. Further infomation will be provided in 2012. The regional Committees are also already working of the definition of the EUCRs, which will be annouced hopefully in short. get ready for an other intensive EUCS season! The European Ultimate CHampionship Finals took place in Bruges (BEL) from Friday Sept. 30th to Sunday Oct. 2nd. We had a wonderful weather with peaks of 26 °C and 8 high quality fields, which allowed teams to play at their best. The Spirit was in general very good. Congratulations to Clapham Ultimate (UK) and to Eyecatchers (AUT) for showing the best one! The European Ultimate Federation opens officially the submission of bids for the organization of the European Ultimate Championship Final (EUCF) 2012. Deadline for bid preliminary submission: Sept. 30th 2011. By this date we need to have at least a rough description of the bid and a preliminary budget, which the EUF committee will define in details together with the bidders. The call for bids for the EUCRs will be opened soon by the Regional Series Committees (RSC). Looking forward to receiving many competitive bids! 3 full days (team arrival Thursday evening, departure Sunday 17:00). Target Date is Oct.5th-7th. As an alternative the weekend before or after can be considered. 24 Open teams and 10 Women teams. In the previous events the average number of players was between 15 and 17, not including guests. Top level Ultimate can be played only on top level fields, both from the grass quality, from the size and security zones. 8 regular sized fields (100m x 37m + 5m restrain lines around) are necessary. As a general rule just 1 Ultimate field fits in a football field. Additionally the goals must be removed or protected, for the safety of the players. Having all pitches on 1 site is an asset. Having a grand stand for showcase games is an asset. Please add in the bid a google map link of the venue(s) and describe the grass quality. At least 1 low budget accommodation must be offered. Price range for the various accommodations must be indicated in the budget. Please add in the bid a google map link of the accommodation and the distance to the venue(s). At least breakfast (3 days) and dinner (2 days) must be provided. Drinking water must be available at each pitch. Please indicate where and how you plan to provide meals and the indicative costs. Indicate how the tournament location can be reached (distance to airports, public transportation system,…). If a shuttle service is necessary between accommodation and venue(s) indicate the planned costs and how it will be organized. Indicate if you plan a pickup service from the next Airport / Train Station. The first goal for a tournament organization must be that the customers (=the players) get what they came for: good regular fields, smooth organization of the competition. Secondary EUF events can be used by local Ultimate associations to get a better visibility which should help getting sponsors and, on the middle term, new players. Please indicate if and how you plan to increase the tournament visibility and which budget you reserve for this. Medals and Trophies will be paid out of the EUF fee. Spirit of the Game Trophies must be covered by the tournament budget or by sponsors. A tournament gift per player is not necessary and should be considered only if covered by a sponsor. As a reference consider that the previous EUCFs had a budget of about 50-60€ per player per day, including accommodation, food (HB), player’s fee and share of the team fee. For the budget plan, please use the EUCF template. We want to make clear that people, who work hard on these events, should receive some reasonable payment. The EUF committee want to make sure that it is able to get very clear visibility of all the costs; that costs are reasonable, and that we help make sure players don’t pay for things that they might prefer not to have if given the choice. I'm happy to annouce that all Regional Committees succeeded in defining the dates and locations of the various EUCRs. The best Open and Women teams of these tournaments will advance to the EUCF in Bruges(B) on October 1st-3rd. Latest 3 weeks prior EUCR the NF must submit the approved EUCS rosters for all their teams using this template. Please notice that on the roster all team members should be listed and not only those how will participate in the EUCS. In the "Addition" column you have to mark the players who cannot be considered part of the EUCS Team according to _your_ national eligibility system. Any change to these rosters after this date will be automatically considered an addition (see the EUCS Eligibilty Rules). Any communication must be done by your representatives in the various Regional Series Committees (RSCs) per email. Emails must be sent to the RSC, with the CSC (csc/at/eucs.efdf.org) and the EUCR Tournament Director in CC. The list of the various national representatives can be found in the Regional subpages as well as the Tournament Director of each EUCR. As you can see, we still have some vacant positions, especially as representative for the women division. It is useless to say how important it is that women discuss and take position on topics concerning the special needs and the development of the women division in Europe! The CSC was able to make the next important step in the complex planning of the EUCS season 2011! We are very happy to announce that the EUCF 2011 will be played in the city of Bruges, Belgium, from Sept. 30th to Oct. 2nd. As decided with the new EUCS structure, the EUCF 2011 will be played by 24 Open teams (divided in 8 Elite and 16 Challenger) and 10 Women ones. Please check the various regional subpages in order to see how EUCF bids are distributed among the regions. The CSC assigned the EUCF to a very experience organizing committee. For 19 years the Bruges' Ultimate club Freezzz Beezzz has been running Tom's Tourney, what has become one of the most important and competitive tournaments in Western Europe. In order to get a better insight of the venue and the organization standards, please check the Tom's Tourney (www.tomstourney.be) website and the videos. The venue consists of 9 top quality football fields all on one site. Since one Ultimate field will be made per football field, there will be plenty of space for warming up and for spectators, still keeping a 5m safety area on the sidelines. Please notice that the poles at the end of the fields cannot be removed and the safety distance won’t be 5m from them. Fields will be of regular length with a tolerance of maximum 4%. For the safety of the players the poles will be protected and the goal nets removed. We are still looking for bidders for the EUCR-C, EUCR-S and EUCR-N, which must be run between beginning of July and beginning of September. If you have a suitable location with 6 good quality Ultimate fields, please contact us asap. The bidding process for the EUCR-W and EUCR-E has already been closed. Announcements about these tournaments will follow soon. Looking forward to another great EUCS season! Thank you very much for the wide attendance at the voting for the EUCS 2011! Question 1: do you accept the new EUCS structure as defined in the concept? The new EUCS structure with the regions, the enlarged EUCF and the new eligibility is officially approved!! Question 3.2 of the concept: Women Eligibility Rule. Do you want Option 3.2.1 or 3.2.2 of the concept? Your vote is binding for the CSC. The women eligibility rule will be like the one for Open, but 5 additions will be allowed prior EUCF. We will check with the EUCF tournament organizer, which schedule fits better, taking into consideration that federations rather prefer less games. The women division at the EUCF will be of 10 teams and played on 3 days. New EUCS Region Structure for 2011!! After 5 successful years of EUCS, it is time to look back and evaluate what is positive and what we should change in order to make it better. This is the final concept for the EUCS starting from 2011, which we want you to vote on. We added also a “what’s new” and a FAQ section on this site, in order to make it easier for you to understand the improvements we made. Question 1: do you accept the new EUCS structure as defined in the concept? (YES/NO)Answering NO, means that you want the EUCS exactly as it was in 2010. If and only if you voted YES to Question1, we would need to know by you your official position about some issues, where we could not reach a consensus within the Central Series Committee. Please notice that our vote will provide only a ranking for the different options, which will be considered by the CSC when defining the schedule, taking also into consideration possible venue constraints. Your vote is binding for the CSC. Since EUCR rosters must be approved by the RSC, starting from 2011 it will be mandatory that a national federation has at least 1 representative in the RSC, if teams of this nation want to play at EUCR. This means that without this precondition, no team from that nation will be admitted to the EUCR. Please send us asap the contact details of your official representative(s), who will become active members of one of the five Regional Series Committees. Thanks a lot for your precious contribution! 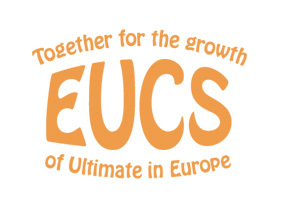 The European Ultimate Federation opens officially the submission of bids for the organization of the European Ultimate Championship Final (EUCF) 2011. Deadline for bid preliminary submission: Nov. 23th 2010. Being the Beach Worlds this year on the traditional weekend of the EUCRs, these tournaments must be likely played before it. Each RSC will define the best date taking into consideration the calendar of the member countries. 3 full days (team arrival Thursday evening, departure Sunday 17:00). It is at the moment under discussion if the women competition will be of 2 or 3 days as well. In your bid, please consider 3 days for the moment. Target Date is Sept. 30th-Oct.2nd. As an alternative the weekend before or after can be considered. We are planning to extend the Open and potentially also the Women division. Details will be announced soon. Bidders should consider a max. of 24 Open teams and 12 Women teams. As a general rule just 1 Ultimate field fits in a football field. Additionally the goals must be removed, for the safety of the players. As a reference consider that the previous EUCFs had a budget of about 50€ per player per day, including accommodation, food (HB), player’s fee and share of the team fee. For the budget plan, please use the EUCF template. This European tournament structure is establishing an annual European Ultimate Championship Series for open and women’s clubs. This annual tournament series allows top European clubs to compete against one another and crown a European club champion. The EUCS creates a base structure and calendar for the series and involve as many teams and nations and players as possible. The benefit of this tournament structure is to create better competition for the top European clubs and provide incentive for mid-level clubs to improve their games with the hope of making it to Finals (EUCFs). Europe has been divided into five geographic regions. Each nation (or group of nations if they are very small) may send a maximum number of qualified teams to its European Club Regional (EUCR) tournament. The ideal entry to an EUCR would be from Country’s nationals results. However a National Federation may also nominate its EUCR candidates. These teams compete at the EUCRs to advance to the European Club Finals (EUCFs). EUCR and EUCF tournaments will be standardized as much as possible in order to ensure fair seeding and important game-play throughout the tournaments. EUCR tournaments will be held ideally from the second half of August to the first half of September and be centrally located in order to minimize travel times for regional teams. The EUCFs will be held in fall in a nation offering the best bid. Attention will be paid to excellent fields and agreeable weather. With the goal being to increase the level of club play in Europe a strict eligibility rule is in place, which encourage teams to work on new players, but still gives the chance to good talents playing in small teams to join the roster of larger ones and make precious experiences, which can be used for the development of their smaller teams.. The EUCS is run by a staff of volunteers with support from the EFDF Director and staff. Other volunteers essential to the operation of the Series include committee members who specialize in elements of competition such as rules, eligibility and tournament formats.